Nothing makes me happier than these wide-open spaces. 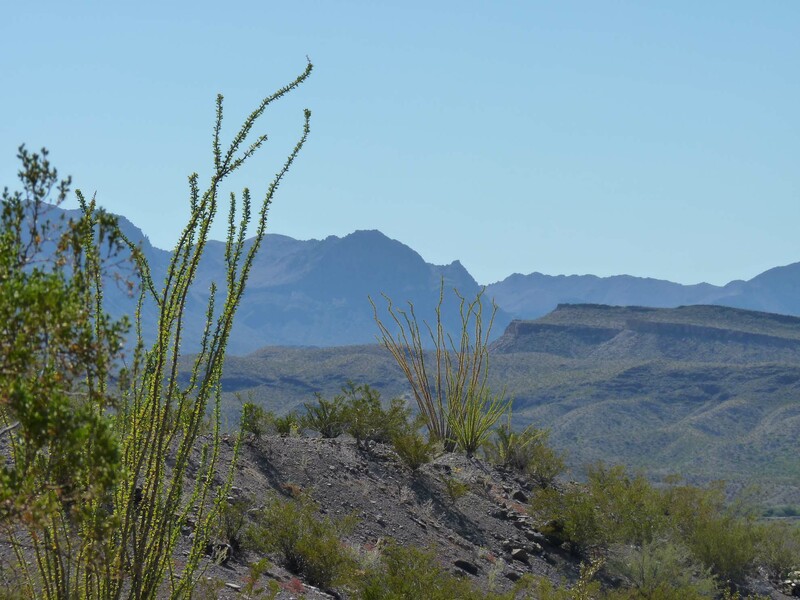 We are on the edge of Texas, looking through the Window of the Chisos Mountains into the mountains of Mexico. 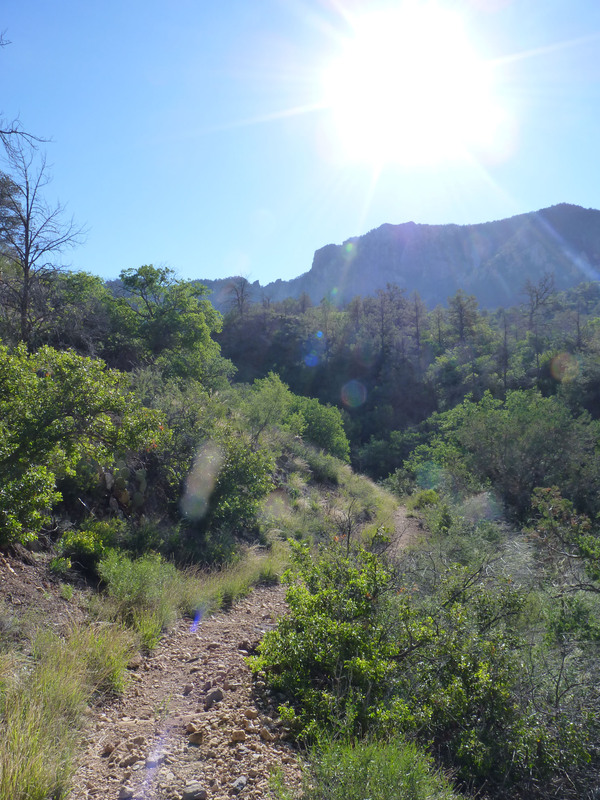 This is the Pinnacles Trail up to the South Rim of the Chisos. 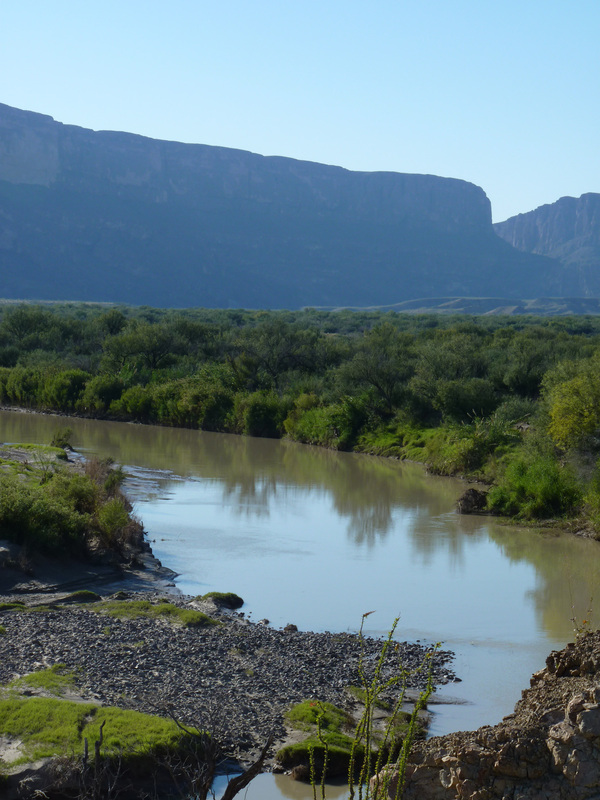 This is the Rio Grande, the river that is the border between Texas (on the right bank) and Mexico (on the left bank). Along the Rio Grande, looking into Mexico. 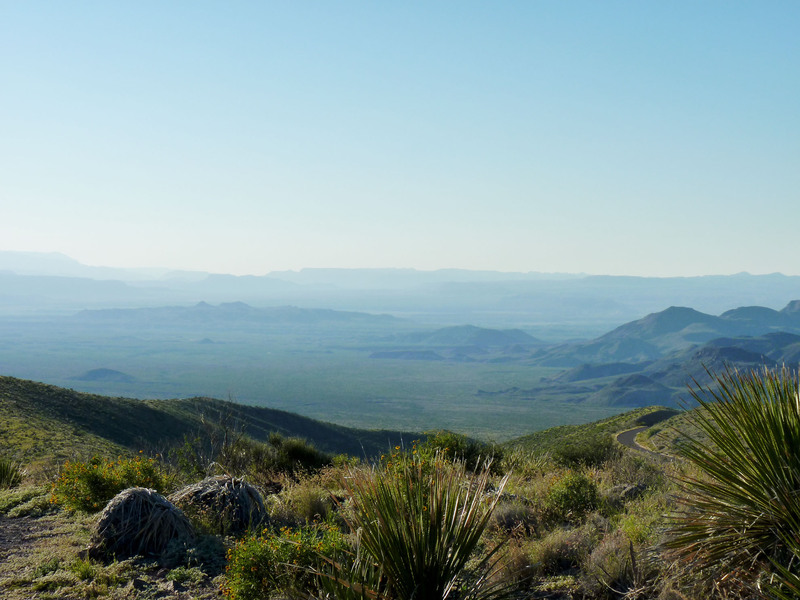 The first four pictures show Big Bend National Park, and the last is on the road in Big Bend Ranch State Park in Texas. I have been going out there every chance I get since 1982, and I even got to live out there as a seasonal park ranger for 8 weeks in the summers of 2006 and 2008. The National Park is over 1250 square miles (3243 square kilometers), or as we like to point out, bigger than the state of Rhode Island. In the summer, there might be only about 1000 people in the whole place. The State Park is about a third of that, about 420 square miles (1090 square kilometers), and only about 3000 people visit it during the year. I love these parks not only because they are sparsely populated, but because they have such a diversity of rock formations, plants, and animals. I have seen bobcats, wild horses, gray foxes, zone-tailed hawks, Mexican jays, and even a black bear there. ← What’s So Interesting Over There? 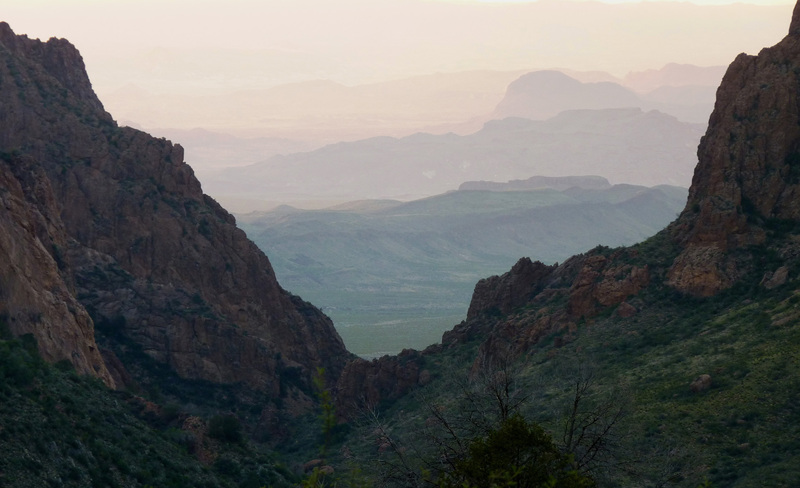 I still can’t believe I’ve never been to Big Bend. One of these days… It looks like such an amazing place, and your pictures are gorgeous. Well, you are always going to all those interesting places like the Ukraine. But don’t think I didn’t remember that when I posted this subtle reminder that Big Bend is waiting for you! Thanks! I went by your blog and I love your poetry – so detailed! Your poems draw beautiful images. Thanks, I love writing poetry. It’s like cooking. Everything’s boiled down to its most pertinent. I’d guess textiles works that way, too — edit all but the necessary amount. That would be a great topic for me to consider. Some artists, poets, and textile artists seem more intent on being obscure and opaque in their work — I prefer something that shows me something new, makes me think — but that I can still understand! That is what I see in your poetry, and I need to think about how that value could be seen in my textile work. Everytime I read one of your posts, I have to rush off and read up more on Texas! Your parks are just amazing – such an extraordinary state! Thank you for all this inspiration. I love that first photo the best–the depth! I get boggled by the idea that you can just look into Mexico . . . and then I remember that I can look into Canada! I would love to see that too. I love borderlands and how the cultures mix there. Wow, great photos! I also love wide open spaces. I went by your blog and saw that you do indeed! You have been to a lot of fantastic places and you write about them in interesting ways!